WASHINGTON (Oct. 14, 2008) -- The Army Materiel Command claimed six Shingo Prizes in 2008 and other commands received a variety of process-improvement awards at the Pentagon Friday. During the awards ceremony at the Pentagon Hall of Heroes, six organizations within AMC were honored with the Shingo Prize for Excellence in Manufacturing, sometimes referred to as the "Nobel Prize of manufacturing." The Shingo Prize has been awarded each year since 1988 by the Jon M. Huntsman School of Business at Utah State University. The AMC organizations were recognized for their implementation of Lean and Six Sigma principles. 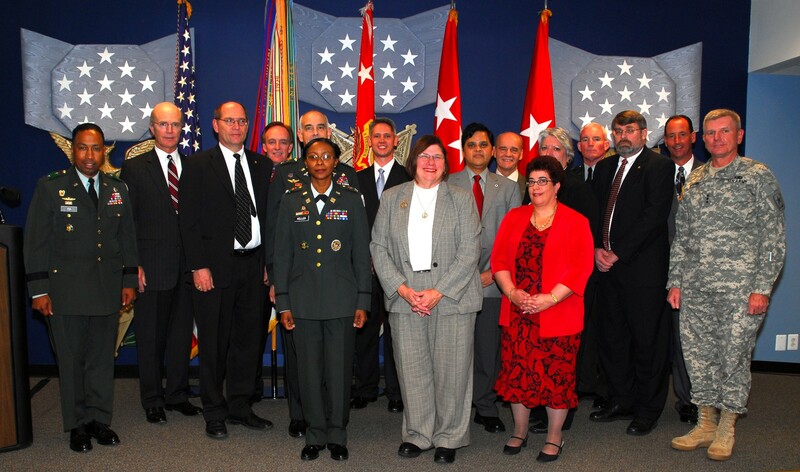 During a ceremony at the Pentagon Oct. 10, the Army presented 2008 Shingo Prizes to six Army materiel Command organizations and presented additional Lean/Six Sigma awards to an additional seven Army organizations. Gen. Benjamin S. Griffin, AMC commander, said developing better Lean processes has been a journey for AMC that has resulted in both savings for the Army and better service to AMC's customers. "We know there are significant savings due to Lean -- tremendous dollar savings, we can quantify that," he said. "But at the end of the day, it's meant to (provide) better support to our customers in the field. That's what this is all about." Griffin said improvements in AMC's manufacturing processes through implementation of Lean and Six Sigma processes have made doing business with the Army more enticing to private sector companies. "When I first came to the command there were two major corporations that looked at me and said 'general, if you were more efficient we would do business with you. You are not efficient so we won't do business with you in your depots and arsenals,'" he said. "Today both those companies do business with us. During the ceremony, the Army also handed out its own awards for implementation of Lean and Six Sigma process improvement. That the Army is now handing out such awards is evidence the service has made headway in institutionalizing Lean and Six Sigma practices, said Lt. Gen. Robert E. Durbin, special assistant to the chief of staff of the Army for enterprise management. "We are at a critical juncture in our Army's LSS deployment," he said. "The important step of institutionalizing Lean/Six Sigma to achieve the enterprise-level deployment maturity requires building internal self sustainment capability. Recognizing the successful efforts of these process-improvement practitioners today, demonstrates we are well on our way in achieving that internal institutional self sustainment capability." • Letterkenny Army Depot - Biological Integrated Detection System, Chambersburg, Pa.
• Tobyhanna Army Depot, AN/ASM-189 Maintenance Electronic Shop Van, Tobyhanna, Pa.
• Tobyhanna Army Depot - AN/TYQ-23 Command and Control System, Tobyhanna, Pa. Both Lean and Six Sigma are business process improvement tools developed chiefly in the private sector to focus on increasing value to customers, saving time and money, reducing waste and improving product quality. A process can be made Lean by re-engineering it to eliminate steps that add no value to the end product, officials said. They said Six Sigma deals primarily with eliminating defects and errors in manufacturing.